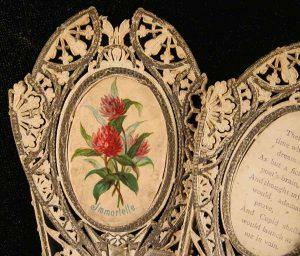 An elaborate fan, of machine cut paper lace, was the Valentine message sent by J. Malcolm Allan’s grandfather to his sweetheart in 1889. 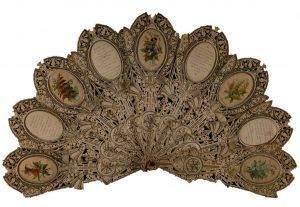 The couple married in 1890, and until it was gifted to the Smith in 2002, the Valentine fan was a family treasure. More versatile than a card, it was a fashion accessory. Valentine messages were much more complex and discreet in the 19th century. The fan maker has used floriography, the language of the flower, to convey certain messages. The flowers on the fan include pansies, signifying ‘you occupy my thoughts’, ferns, denoting discretion, secrecy and serenity, clover, meaning ‘be mine’ and forget-me-nots, ‘true love.’ The recipient could check the messages in the popular flower books of the time. One of the verses reads ‘Some day I hope you will be mine,/ I thine,/ Together bound by that holy tie,/ That close each faithful heart to heart shall twine./ With Love that lasts to all eternity. Valentine was an early Christian saint who was marched in Rome for performing weddings for soldiers who where forbidden to marry.